This is a study from Ephesians 5:25-33, which explains how the Christian husband is like Jesus Christ. What is the context for this passage? It is always important to consider any passage of Scripture within the different contexts. The first and largest context is the entire Bible. The theme of the Bible is how God redeems, restores, and renews his people through the God-man, Jesus Christ. The next context would be the entire book in which the passage is found. In this case, Ephesians. Each section in Ephesians has to do with Jesus Christ - our life and walk in him. Notice in Ephesians the emphasis Paul places on our walk in Christ. We start off walking worthy of the calling God has for believers in Christ. We are to walk with lowliness, gentleness, great patience and forebearance with one another to keep the Spirit's unity in the bond of peace. This is the essential backdrop for believers in Christ's Church, including the husband and the wife in Christ. Both the husband and the wife are to walk with lowliness, gentleness, great patience and forebearance with one another! Ephesians 4:17 - not like the world walks. Ephesians 4:20-24 - as a new creature (or man) in righteousness and holiness. Ephesians 5:1-2 - in the sacrificial love of Christ. Ephesians 5:8-10 - in Christ's light. Ephesians 5:15-17 - done carefully according to God's will. Ephesians 5:18 - God's will is that we be filled by the Spirit. Ephesians 5:19 - to speak to each other in psalms, hymns, spiritual songs, making melody in our hearts to the Lord. Ephesians 5:20 - to give thanks always for all things to God in Christ. Ephesians 5:21 - to submit to one another in the fear of the Lord. Each of these expressions of walking in Christ is the foundation for how the Christian husband is going to live and conduct himself. Ephesians 5:22 - the wife submits to her own husband as she submits to the Lord. Ephesians 5:24 - the wife submits to the husband as the Church submits to Jesus. Ephesians 5:25 - husbands love their wives as Christ loved the Church and gave himself up for her. More about this in a moment. Ephesians 6:1-4 - children obey their parents in Christ. Ephesians 6:5-9 - servants submit to their masters in the Lord. Ephesians 6:9 - masters do the same thing in Christ. More on this below. In Ephesians 5:25, the Christian husband's duty is to love his wife as Christ loved the Church and gave himself up for her. Now, before we dismiss this verse as proving husbands do not submit, especially to their wives, we need to consider how Jesus loved his Church. First, he submitted to the will of God (Ephesians 1:3-10). The Christian husband is never higher or better than Christ the Husband who submitted to the Father to redeem his people. If we take the main point and introduction in Ephesians 1:3-10 and run it all the way through to Ephesians 5:25, we see what the meaning and the application for the husband is to submit. How? He submits to the plan of God by loving his wife as a servant like Christ! Being a servant (the term is better understood as slave) means he submits like all servants submit. How does he submit? Well, not only like Jesus but he submits by serving his wife in, through, by, and for love. If this is hard to grasp, think of related terms for submit: acquiesce surrender, or yield and then think about how genuine love functions. True love functions in servitude for another. If this is hard for a husband to understand, then let me give you an example of loving service: when you change your child's diaper full of crap (if you don't, you need to) you are serving your baby out of love. To really love others, to really love your wife, you surrender yourself in servitude with acts of love. Let's move on to Ephesians 6:9. Prior to this verse we have the admonition to servants to submit to their masters. As with the idea of wives submitting to their husbands, this command is a "like duh." Of course servants are supposed to submit to their masters! Everyone knows that. Ah, but like the condition set for the type of submission the wife has for her husband, there is also a counter-cultural condition given to the slave: submit or obey "with fear and trembling, with a sincere heart, as you would Christ, not by the way of eye-service, as people-pleasers, but as bondservants of Christ, doing the will of God from the heart, rendering service with a good will as to the Lord and not to man, knowing that whatever good anyone does, this he will receive back from the Lord, whether he is a bondservant or is free" (Eph. 6:5-8, ESV). That's a radically big order from the Lord. This brings us to verse 9, "Masters, do the same to them and stop your threatening, knowing that he who is both their Master and yours is in heaven, and that there is no partiality with him." What does it mean, "do the same thing to them?" Out of "fear and trembling, with a sincere heart, as you would unto Jesus Christ, not for eye-service and people-pleasers but doing the will of God from the heart, rendering service with a good will as to the Lord... knowing that whatever good anyone does, this he will receive back from the Lord." Master-husbands, do the same to your wives and stop your threatening, knowing that he who is both your wife's Master and yours is in heaven, and that there is no partiality with him." Do this out of "fear and trembling, with a sincere heart, as you would unto Jesus Christ, not for eye-service and people-pleasers but doing the will of God from the heart, rendering service with a good will as to the Lord... knowing that whatever good you do, this you will receive back from the Lord." With that as the contextual backdrop, let's move on. What is the ideal husband? While we all have the call to submit to Christ, which is expressed in different ways, the responsiblity for the wife in Christ is submission to her husband. In this way, the wife is like Jesus, who submits to the Father's will or like the Holy Spirit who submits to God the Son and God the Father. The Christian husband submits to Jesus, which is expressed through his Christ-like love for his wife, as we have seen above. Marriage between the husband and wife is an intimate and mysterious union. It is a symbol of the union Jesus Christ has with his Church-Bride. The Christian marriage ideally reflects the covenant bond and relationship we have with Christ and that relationship in turn, is the model for the Christian marriage! In fact, the major point of this section is not about wives submitting to their husbands, as I have frequently read and heard. Instead, it is to teach God's people the type of union Jesus has with his Bride! This is a loving, intimate, covenant bond. One big implication of this passage is that shows us how the husband is like Jesus in his love for his church is this: No husband can honestly say that he is the good head of his wife unless he truly loves her! There are men who know this passage and are students of the Bible, who claim they are heads of their families who demand their wives submit to them. There are other men who are domestically violent but insist they really do love their wives. Such are deceived and make every effort to deceive others. Perhaps they feel a short rush of the oxytocin hormone? Maybe they grew up in a home that bragged about love but was brutally toxic? It might be they have a serious psychological disorder. It could be they are not even Christian men with saving faith in Jesus. There are any number of reasons why these men are like this. The Bible is clear about genuine love. An entire chapter is dedicated to defining and describing true love that flows from a life in Christ (1 Corinthians 13). Genuine love is the intentional investment and active display for another’s well-being that seeks their highest good for life. In plain terms, Ephesians 5:25-33 gives us why and how the husband loves his wife. We find in this passage a directive that demonstrates the glory of Christ in the Christian life. Christ-like love is not merely the feeling but compassionate actions for the benefit of the wife. Husbands, the bottom line is not merely what you say that finally proves whether you are showing love but it is also what you do! What are husbands to do? We find the answer in Ephesians 5:25 and following. What was the minimum requirement for Jewish husbands toward their wives? See Exodus 21:9-11. Yet, in the New Testament, this command goes much further. Read Ephesians 5:25 to answer how: the way Jesus loves his Church. How does Jesus love his bride? On the basis of these verses, what did Jesus Christ do for his bride? All that Jesus did for his Bride was predicted in the Old Testament. See, for example, Isaiah 62:5. The major plan of Christ’s life and death was to gain the Church for himself as the object of his affection and delight. 2. Second, he loves his Church by what he does for her. a. What is he doing now, according to Ephesians 5:26? b. And according to Ephesians 5:27? The design of Christ’s death was to gain the Church for Himself as the object of delight AND to prepare her for her highest destiny: her holiness and happiness. Let me clarify. Jesus Christ is the only one who can truly make someone holy and happy. The husband’s role is to promote things in his Christian bride’s life that will foster holiness and joy. However, ultimately the woman chooses holiness and happiness. This being true, how is this applied by the Christian husband? 1. Read Ephesians 5:28. Here are some things to help better understand what we mean. a. Now read Genesis 2. According to Genesis 2, in what sense is the wife part of the husband’s own flesh? Notice this: In the beginning, the woman was made as a result of an operation, which God performed upon the man, Adam. A deep sleep fell upon the first Adam. The woman came from Adam’s side. The man and woman are united again into one flesh. A deep sleep fell upon the second Adam. The Church came from Christ’s side! Jesus Christ and his Bride are united as one new person (Ephesians 4:13-16). To be members of Jesus’s body means that we are derived from and partakers of Christ. Just as Eve initially derived her life from Adam so too we derive our life from the new Adam. b. In Ephesians 5, for Christ to nourish the Church means to build up, provide for, and offer care. Husbands are to nourish their wives by building up, providing for, and offering care. c. Like Jesus, husbands are to cherish their wives. To cherish means to respect, appreciate, and help. We will explore more in part 2. 2. Read Ephesians 5:28 again. 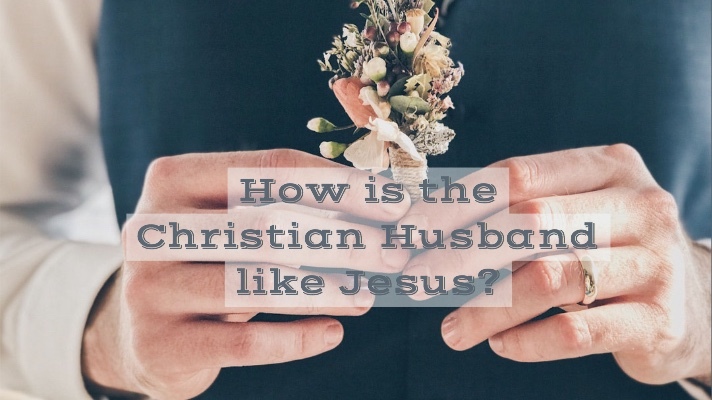 In what specific way(s) does the husband act like Jesus toward his wife? 3. Look at Ephesians 5:29. How are the preceding verses about Christ's love for his Church summarized for the husband? What is he ultimately to do? 4. This is supported by the reality of the God-designed bond between husband and wife (Ephesians 5:30-31). The Son left the courts of His heavenly Father to come for His bride and become one with her! The physical reality of original creation is just as true in the spiritual reality of the second creation! Man and woman leave (emotionally, dependently, physically) their parents and cleave to one another, becoming one. By the way, not doing this is one of the major causes for marital conflict. How would you summarize and apply this to your own life as a Christian husband? Are you a Christian husband? Do you need help living out your life in Christ? Would you want to grow as a husband in order to please God and bless your wife as God designed? If so, set up an appointment today for you first consultation, which is free.